Festival season is around the corner and its about time, Indian e-commerce companies will start their Biggest Annual Sale starting October 1st. While the e-commerce giants will burn their cash, it’s time for the online shoppers to make the most out of it. 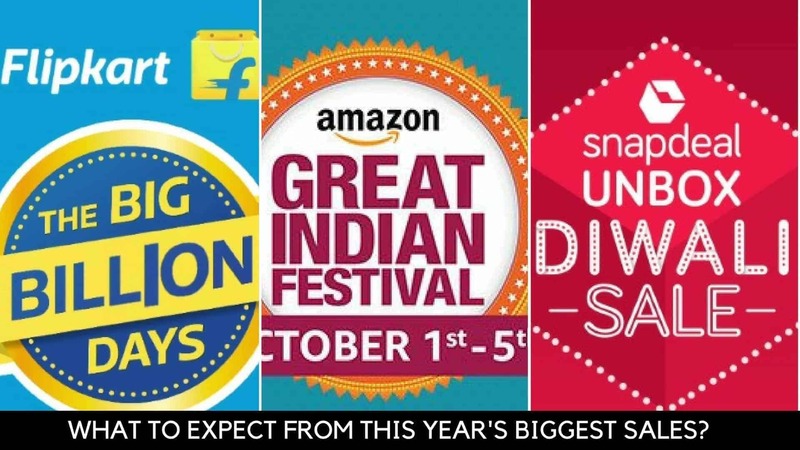 Flipkart Big Billion Day 2016, Amazon Great Indian Festival Sale and Snapdeal Unbox Diwali Sale are coming to lighten up your Diwali. The is probably the 3rd year of the same sale and the e-stores will try to avoid the common mistakes they made in the past years & score better customer satisfaction. The Great Grand Indian Online sale is about, to begin with, Flipkart, Amazon and Snapdeal fighting head to head followed by Shopclues, eBay, Tatacliq and other online stores. 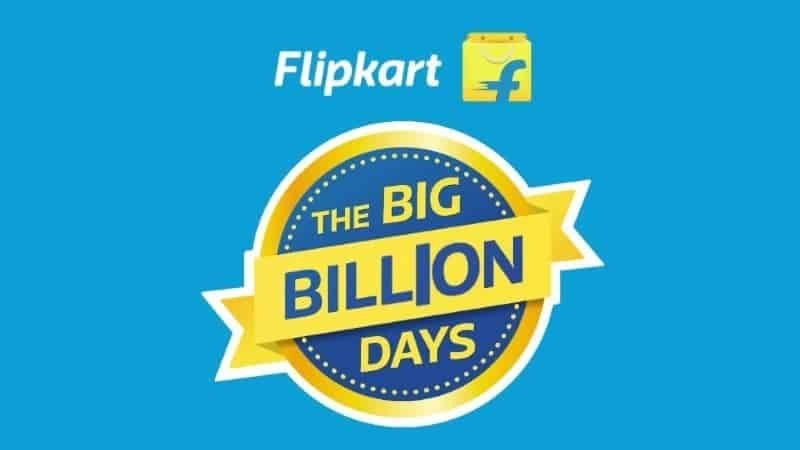 With Amazon Great Indian Festival Sale beginning the battle on 1st October, its biggest competitor Flipkart Big Billion Day 2016 will kick off on 2nd October. Like every year, there is a lot of expectation among shoppers to “Checkout” their “Wishlist” on the respective portals. Let’s take a deep dive and understand what to expect from these sales. Amazon has never opted for unrealistic deals unlike Flipkart, like offering mobiles or hard-drives for Rs. 1 and so on. Instead, in the past Great Indian Sale, Amazon has provided remarkable discounts with additional cash backs and freebies. 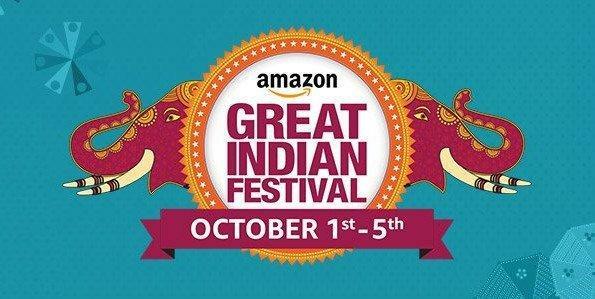 Amazon Great Indian Sale will begin on October 1st and will last till October 5th. Every 30 minutes there will be New Lightning Deals On Mobiles, Laptops, Fashion and other categories on Amazon India. Amazon is bringing a new concept called Curtain Raiser Deals where the users will vote for the 2 sets of deals, and the one with the maximum votes will be the first one to go on sale at 12 am midnight on October 1st. For all the Amazon Prime users, the festive deals will go live 30 minutes in advance. **The list will be updated as soon as new offers are announced. Though Amazon Prime offers discounted same-day delivery and free 2-day delivery, expect delayed deliveries due to the order volumes. However, Amazon Prime will help you save shipping charges on products which are below Rs. 499. Father of failed promises and sale blunders, Flipkart is all set to not-to-repeat its mistakes made in the past 2 Big Billion Day sales. Server crash, insanely late deliveries, increased MRP to bump up discount value, deals running Out of Stock within seconds were few major issues which crippled Flipkart. Already in a lot of troubles due to change of management and twice devaluation, Flipkart will leave no stone unturned to avoid the mistakes it made in the past. Flipkart Big Billion Day Sale will begin on October 2nd and will end on October 6th. Flipkart’s major revenue generator category is Electronics. With my experience I can confidently say, Flipkart provides better discounts than Amazon on electronics. The prices are always competitive on Flipkart. Flipkart will start its Big Billion Day sale with Fashion, Home, TV, and Appliances sale on October 2nd followed by Mobiles & Accessories on October 3rd, Electronics on 4th and in the last 2 days, the sale will be in all the categories. Like Amazon’s Curtain Raiser Deals Flipkart has created Your Wish, Our Offer where there will be great offerings on top wish-listed products. Don’t forget to add your favorite products to the wishlist. Along with this, there will be new product launches with launch offers like Samsung Galaxy On8, Mi Air Purifier 2, BPL washing machines, etc. Also, 50 Motorola Deck Bluetooth Speakers to be won every day and top 8 spenders will win an assured trip to Thailand. Having a Flipkart First account will be an additional advantage. It costs Rs. 500 for a year and provides similar advantages like Amazon Prime with Free Shipping on all orders with Flipkart Assured tag. Snapdeal has been in a pool of troubles since the Aamir Khan’s remark issue. From App uninstalls to negative ratings on PlayStore and Order cancellation, they have faced a lot of uninvited trouble since last November. There have been several instances where customers have accused Snapdeal of sending brick/detergent soaps instead of Mobile Phones. Snapdeal has revamped their Website, Mobile App, Logo and Seller Policy to give a new branding. Let’s see if they can fight the 2 giants and get the last laugh in their Unbox Sale. Snapdeal will begin their Unbox Sale along with Flipkart on October 2nd and it will last till October 6th. Snapdeal has always followed a similar campaign of Hourly Deals which will continue this year as well. With discounts up to 70%, a large number of products are up for the grabs. Snapdeal also has overhauled their Snapdeal Plus service and it’s now called as Snapdeal Gold which comes with Free next day deliveries, extended 14-day returns and no shipping charge. Along with this, there will be an offer on all bank cards, which is a huge plus point. I have seen in the past, Snapdeal providing amazing discounts on Large Appliances with an additional discount and bank offers. So if you are waiting to buy any Large Appliance, do keep an eye here, we will put up the links to the best offers. Apart from these 3 major online shopping sites, Paytm, eBay, Shopclues, Infibeam, Myntra, and Jabong will also be running Diwali offers. Don’t forget to subscribe to our social media channels for the best deal updates. Few unethical sellers hike the MRP to bring the product under bigger discount category thus misleading the buyers. Transparent refund and replacement policy to avoid sellers cheating buyers with aged/faulty products. Dealing with NonFulfillment Sellers, hiking the Shipping Price to maximize the profit. Handling traffic & avoiding server issues, especially during the midnight (when the sale kicks off). Seller ends portal issues/glitches like Later Order Updates, issues with processing print labels, etc. Timely dispatch & delivery of products and after sales grievance assistance. Sign-in in all the leading e-commerce websites before the sale begins. Save your primary shipping address and preferred bank cards in advance. Add the products you are waiting for, in your wishlist on respective shopping sites. If a deal has been added to your cart, try to complete the checkout within 5-10 minutes to avoid Out Of Stock issues. Try to place the order with sellers registered under Fulfillment by Amazon, Flipkart Assured or Snapdeal Gold to avail smoother & transparent return policy and avoid getting fake, defective or damaged products. Try to locate the deals with from website, as it’s always easier to filter and browse the website. Once you have found your deal, order it from the app for additional discount. Keep your shopping apps updated.